French Open organisers say they are narrowing the pay gap between leading and lower-ranked players by increasing prize money for those knocked out in the early stages at Roland Garros. Players who are eliminated in the first week of the Grand Slam will see an average increase of over 10% in their earnings. Players who lose in qualifying will earn an average of almost 15% more. Those who reach at least the quarter-finals will receive on average 6% more. 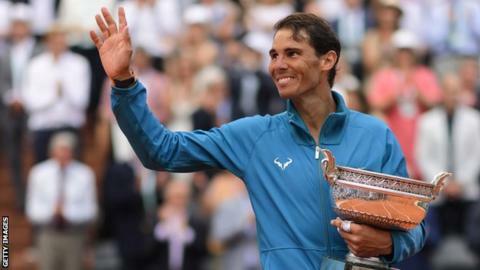 In total, the clay-court tournament's prize fund - across all men's and women's tournaments - has increased by 8% from 2018, to a total of 42.7m euros (£36.9m). This year's French Open starts at Roland Garros on 26 May, with the tournament concluding with the men's singles final on 9 June. Bernard Giudicelli, president of the French Tennis Federation, and tournament director Guy Forget said they wanted to continue narrowing the gap between the money earned by the tournament winners and the players who are knocked out in the first round. One of the reasons ATP chief executive Chris Kermode has not had his contract extended is thought to be that some male players are unhappy with the distribution of prize money on their tour, believing not enough trickles down. Another frustration is said to be that Kermode did not secure more prize money from the four Grand Slam events, which function independently of the ATP and WTA tours. The US Open continues to be the highest-paying Grand Slam with a total of £40.2m last year, with £34m on offer at Wimbledon and £33.9m at this year's Australian Open.